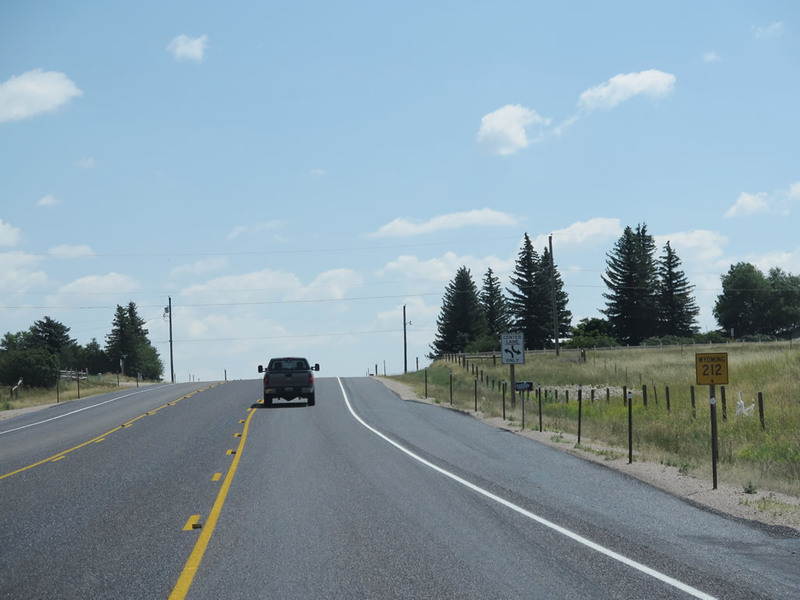 Interstate 25 and U.S. 87 travel together through much of Wyoming, and the Wyoming Department of Transportation takes care to ensure the U.S. route is routinely signposted. 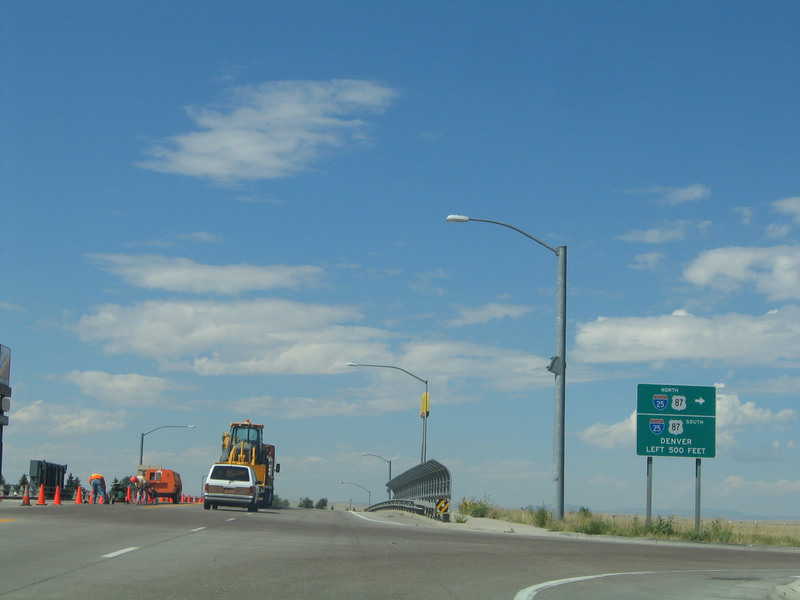 This particular shield assembly, dated from 2010, is located on southbound Business Loop I-25, southbound Business U.S. 87, and westbound Wyoming 212 (College Drive) just before the diverging diamond interchange with Interstate 25. Photo taken 08/11/14. 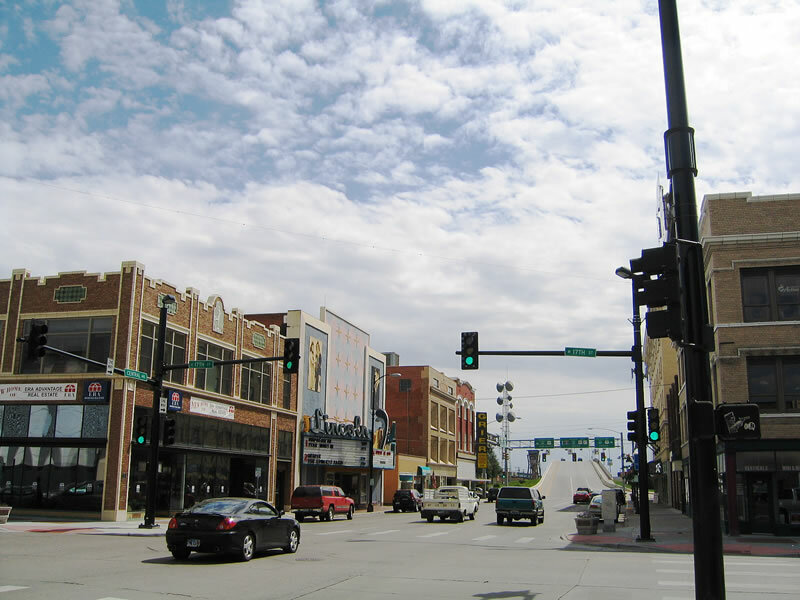 In Cheyenne, Business Loop I-25 follows College Drive (Wyoming 212) and Central/Warren Avenues (U.S. 85). 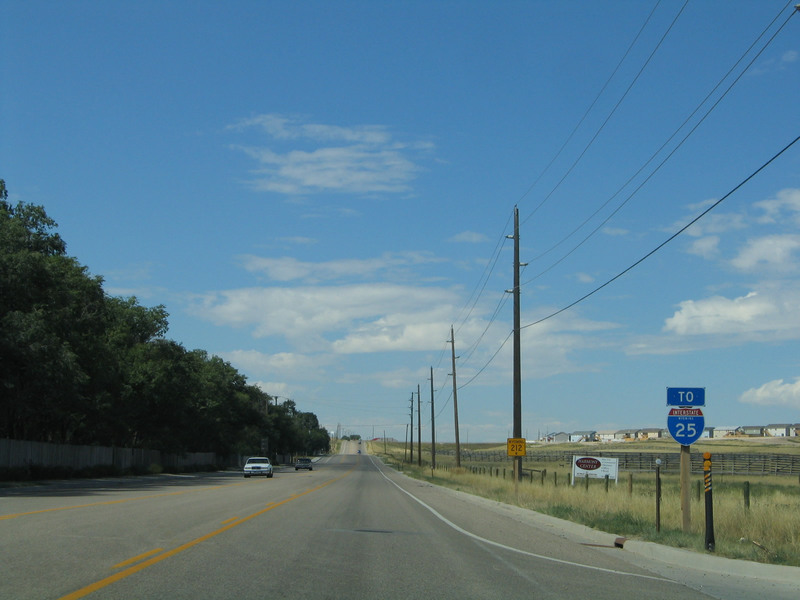 Business Loop I-25 is cosigned in its entirety with Business U.S. 87, and partially with U.S. 85, Interstate 180, and Wyoming 212, the Cheyenne half-loop, eastern bypass route. 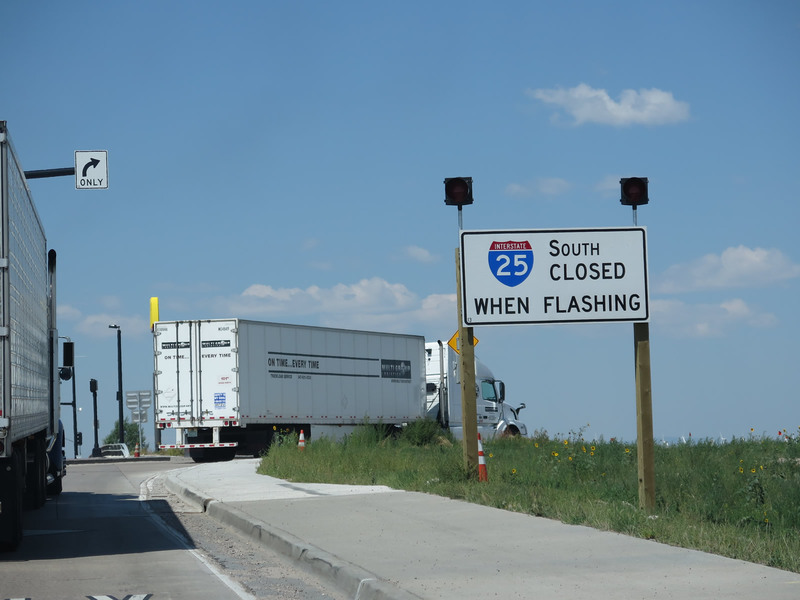 As College Drive starts to cross over Interstate 25 and begin its eastbound journey as Business Loop I-25, Business U.S. 87, and Wyoming 212, we meet the first ramp that connects to Interstate 25 and U.S. 87 south to Fort Collins and Denver. 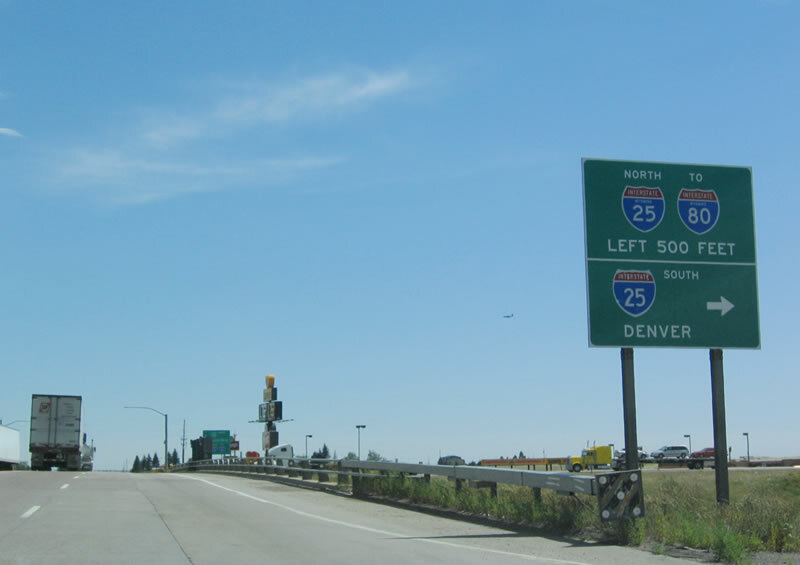 At the time we took these pictures, the interchange with Interstate 25 was a standard diamond interchange. 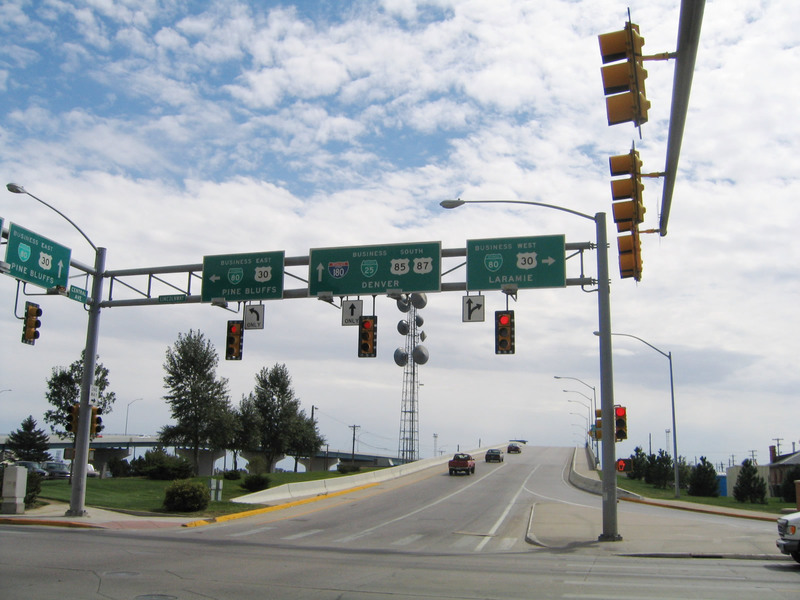 Wyoming Department of Transportation modified this interchange into a diverging diamond, which resulted in the installation of traffic signals and a unique switch in traffic direction to help reduce waiting times. Photos taken 07/02/12 and 09/01/04. Eastbound College Drive traffic merges onto the left side of the bridge over Interstate 25. This is a centerpiece of how a diverging diamond interchange works. 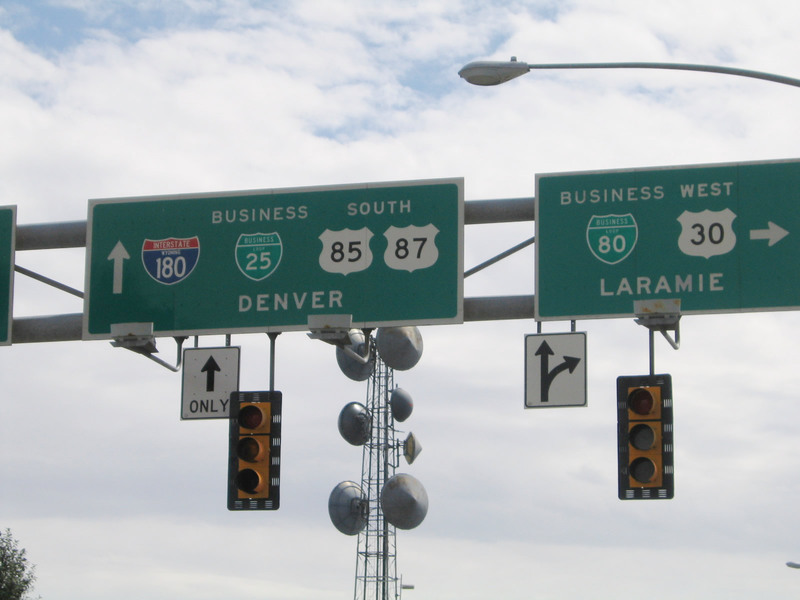 Business Loop I-25, Business U.S. 87, and Wyoming 212 will merge back to the right side of the road after meeting the eastern set of on/off ramps. 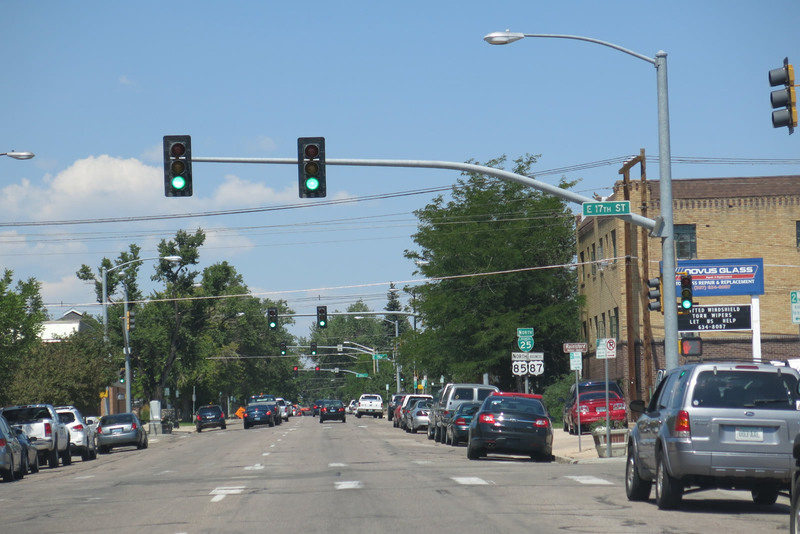 Note the relatively unobstructed left turn afforded onto Interstate 25 and U.S. 87 north; no need to wait for a left green arrow. Photos taken 08/11/14. Traffic on eastbound College Drive merges from the left side of the bridge back to the right side after meeting the offramp from Interstate 25 north to College Drive east/west. 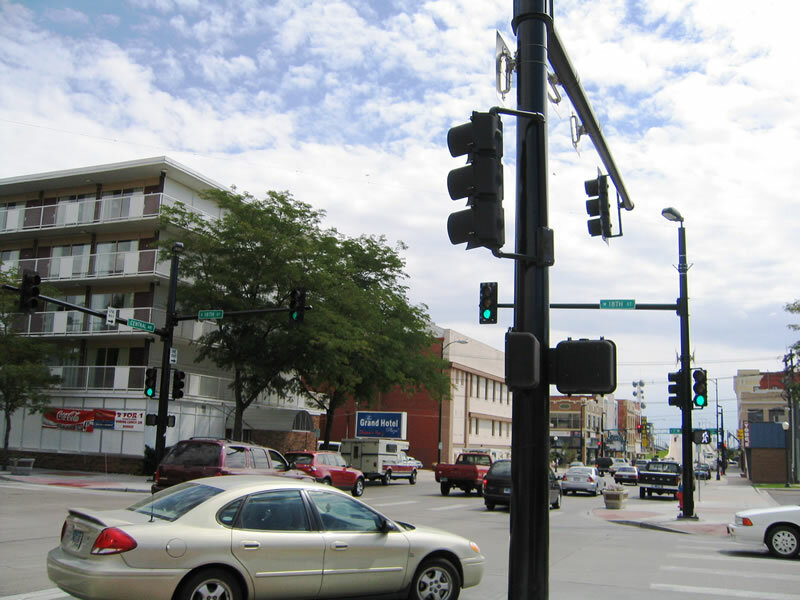 The traffic signals have angled arrows to help motorists navigate this unusual configuration. Photos taken 08/11/14. 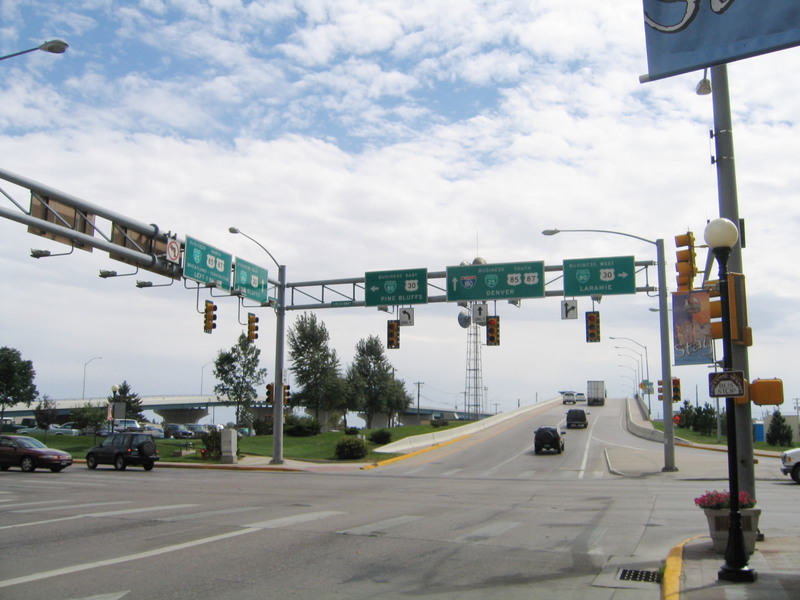 Before the diverging diamond interchange was built, a more standard left turn was required. 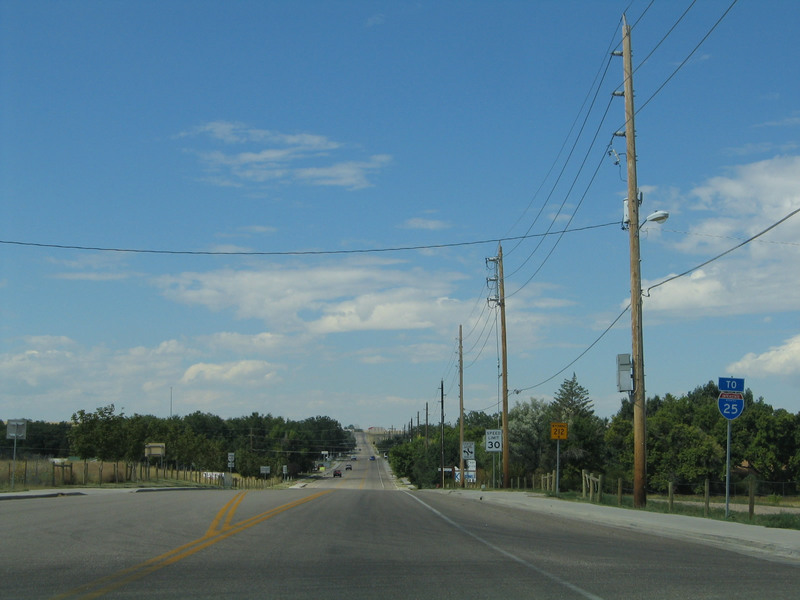 After crossing over Interstate 25, College Drive used to approach the left turn onto northbound Interstate 25 and U.S. 87. From here, Business Loop I-25, Business U.S. 87, and Wyoming 212 being their northbound journey toward Cheyenne and Laramie County Community College. This sign was gone by 2013. Photo taken 09/01/04. 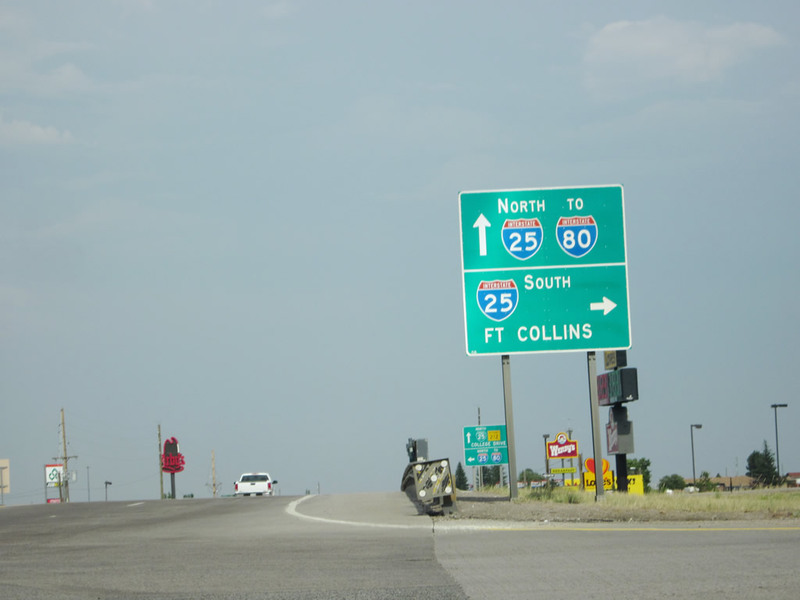 In 2002, the first route markers posted along northbound Business Loop I-25, Business U.S. 87, and Wyoming 212 used to be this shield assembly along eastbound College Drive after the Interstate 25 and U.S. 87 interchange (Exit 7). 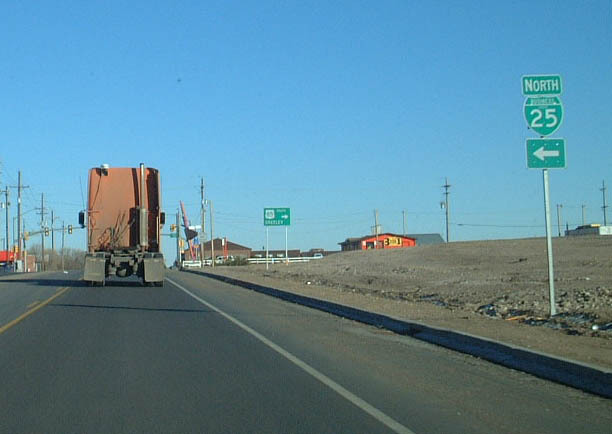 Wyoming 212 is a semi-belt route around the eastern half of Cheyenne. 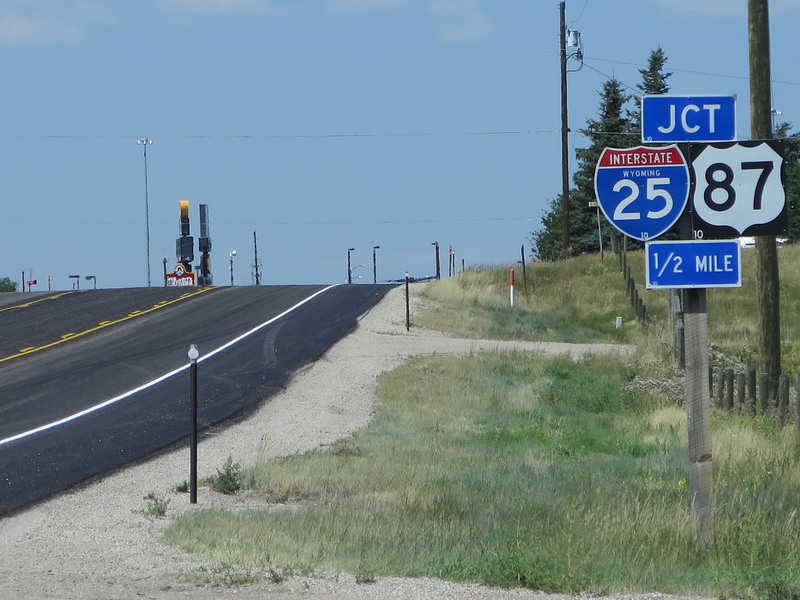 It is cosigned with Business Loop I-25 from its southern terminus until the U.S. 85 junction. By 2012, this shield assembly was gone. Photos taken 02/02/02. 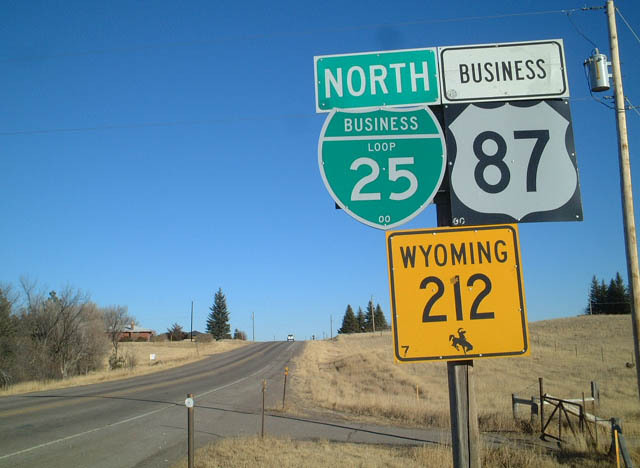 The 2002 shields were replaced with two separate route markers, one for Business Loop I-25 and a second for Wyoming 212. Business U.S. 87 was no longer signed in the first shield assembly. Photos taken 08/11/14. Continuing east, northbound Business Loop I-25 and Business U.S. 87 prepare to split away from Wyoming 212/College Drive and turn north onto U.S. 85 toward Cheyenne. 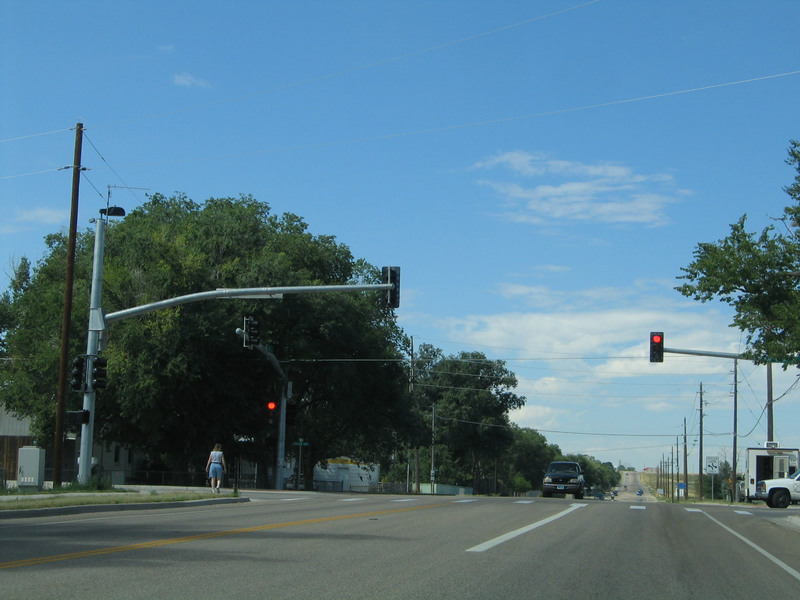 The green sign to the right of the approaching intersection indicates that all traffic headed toward Greeley, Colorado, should turn right (south). 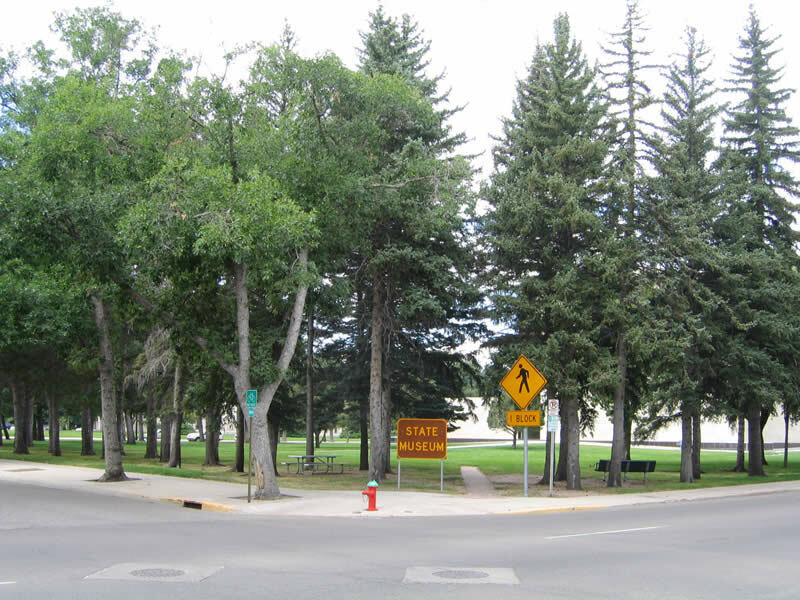 There is no mention of Wyoming 212 in the signage, but that route continues straight ahead through the intersection. 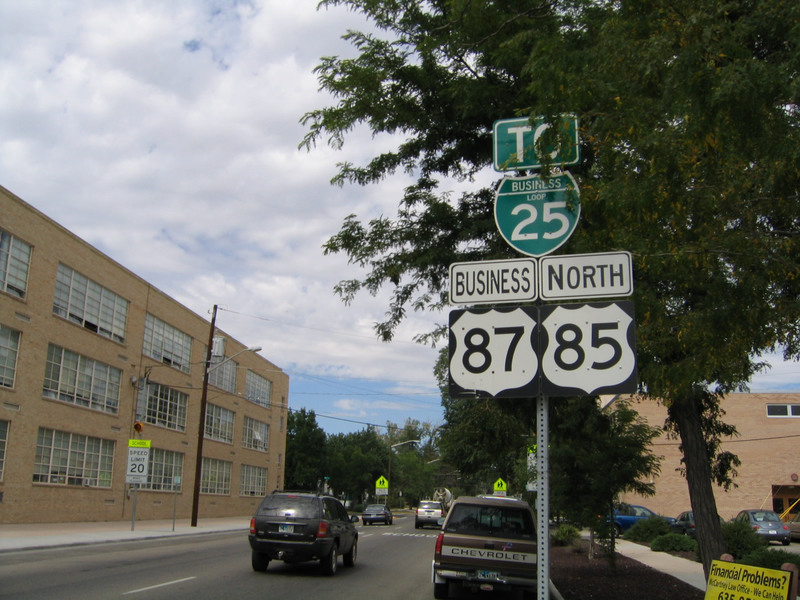 Business U.S. 87 is assumed to follow Business Loop I-25 to the left. Photo taken 02/02/02. 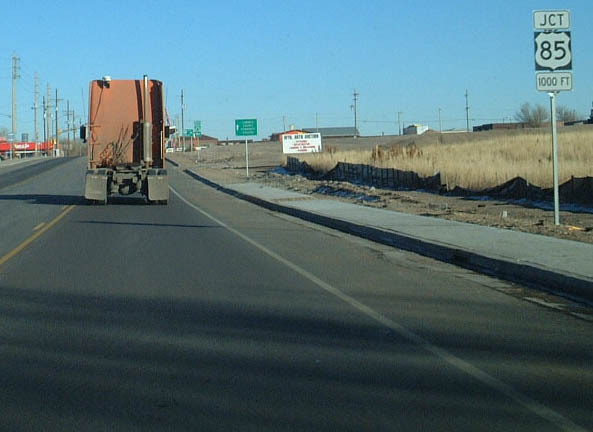 Eastbound Wyoming 212 and Business Loop I-25/Business U.S. 87 (College Drive) approach U.S. 85, South Greeley Highway. 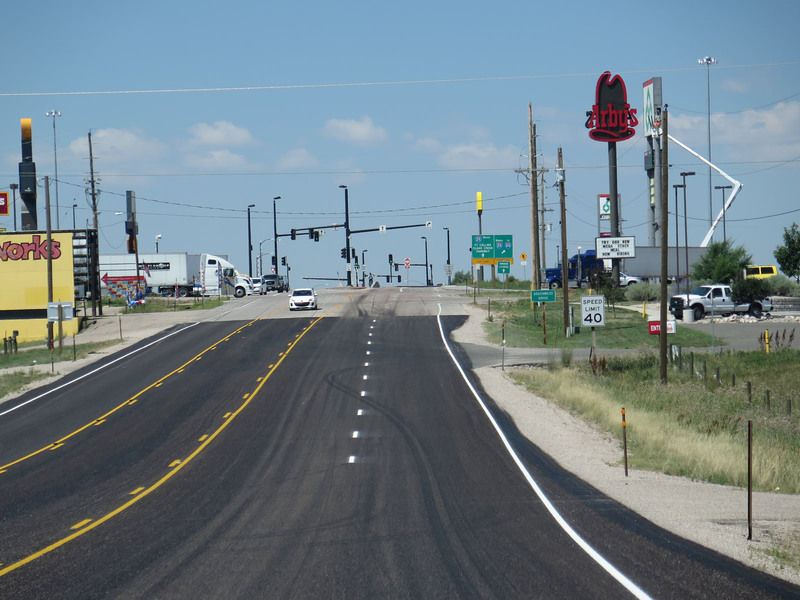 Wyoming 212 continues east along College Drive toward Laramie County Community College, while Business U.S. 87 and Business Loop I-25 turn north toward downtown Cheyenne. Photo taken 02/02/02. 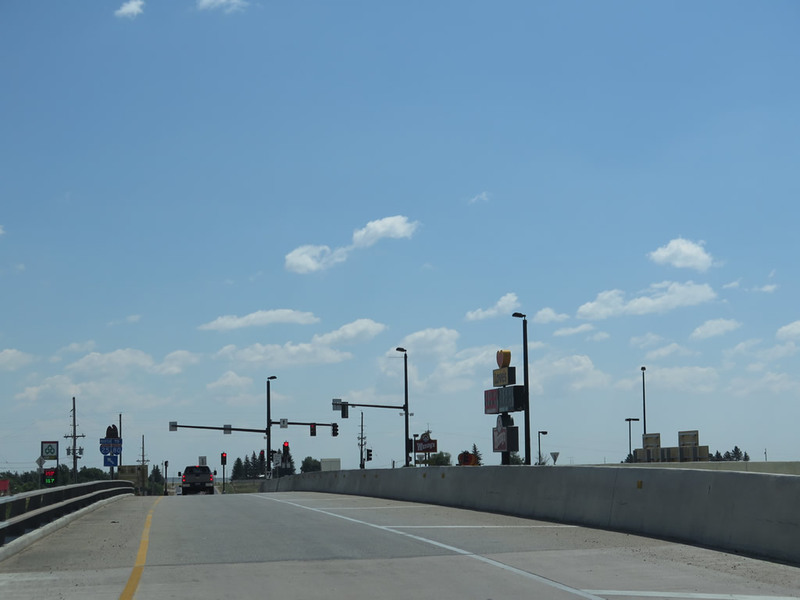 See the U.S. 85 page for pictures and commentary of this section of Business Loop I-25. 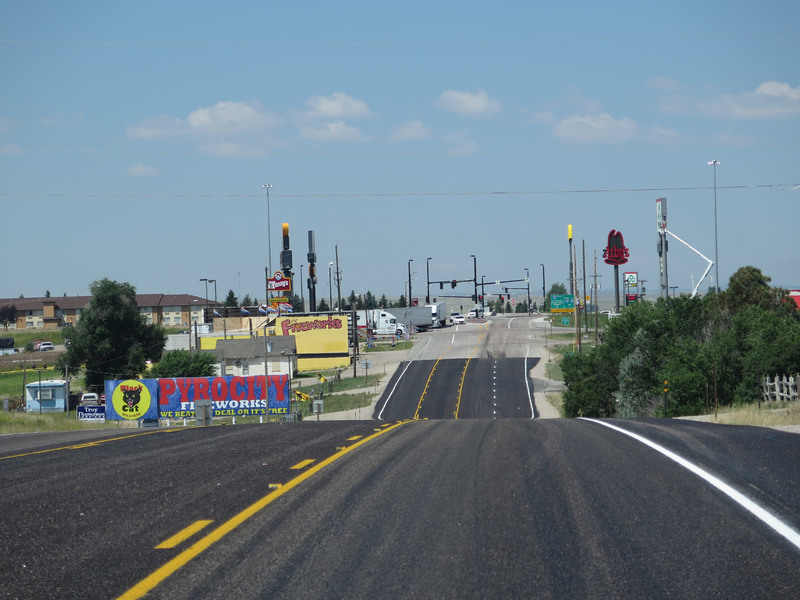 See the Interstate 180 page for pictures and commentary of this section of Business Loop I-25. 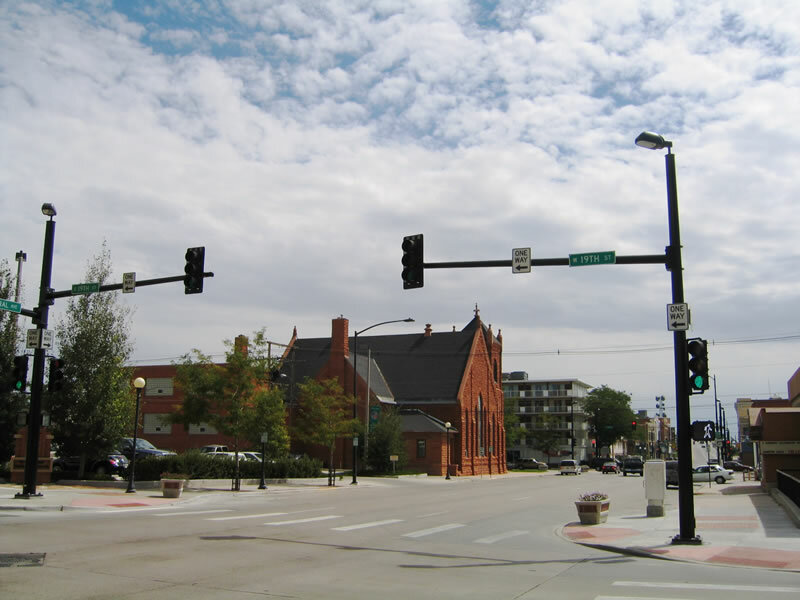 One block north of Lincolnway, Business Loop I-25, U.S. 85, and Business U.S. 87 (Warren Avenue) cross 17th Street. Photos taken 08/15/13 and 09/07/05. 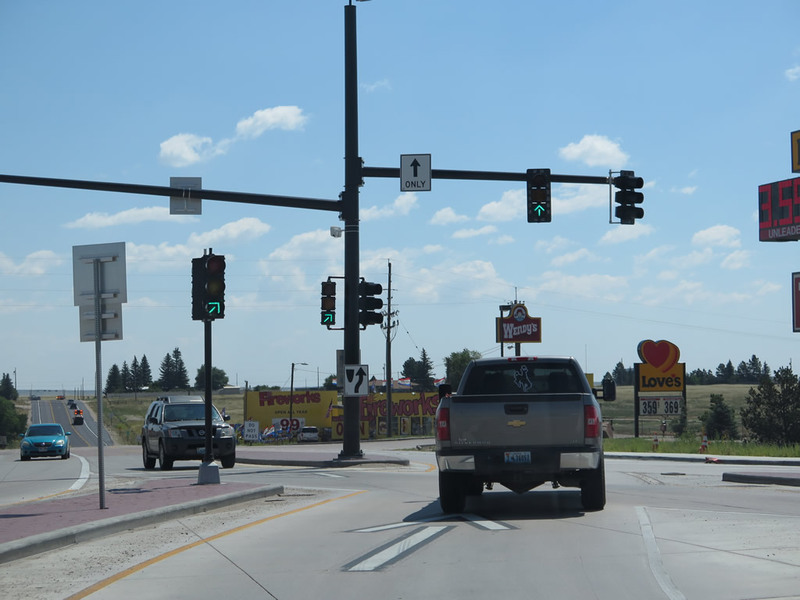 A reassurance shield assembly is posted for Business Loop I-25, U.S. 85, and Business U.S. 87 on northbound Warren Avenue after the 17th Street intersection in downtown Cheyenne. 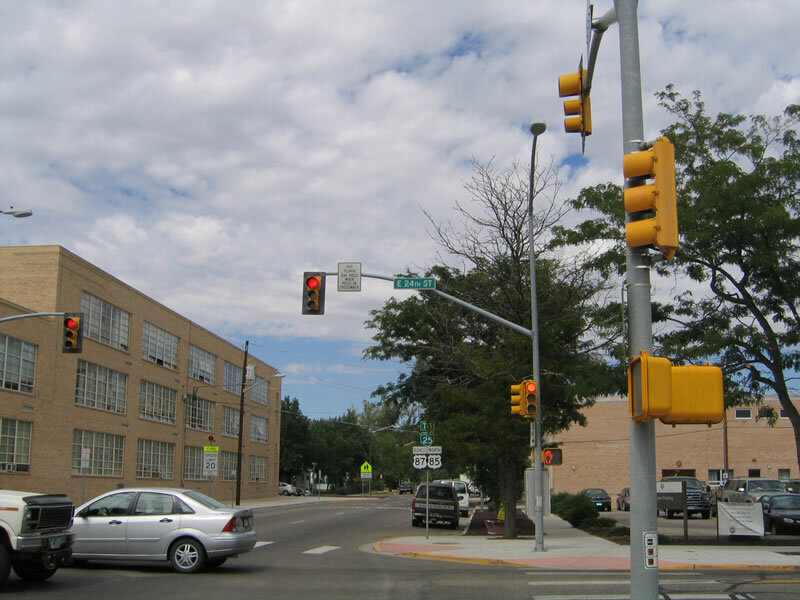 Plenty of traffic signals are visible in the blocks ahead as Warren Avenue proceeds north in downtown Cheyenne. Photos taken 08/15/13 and 09/07/05. 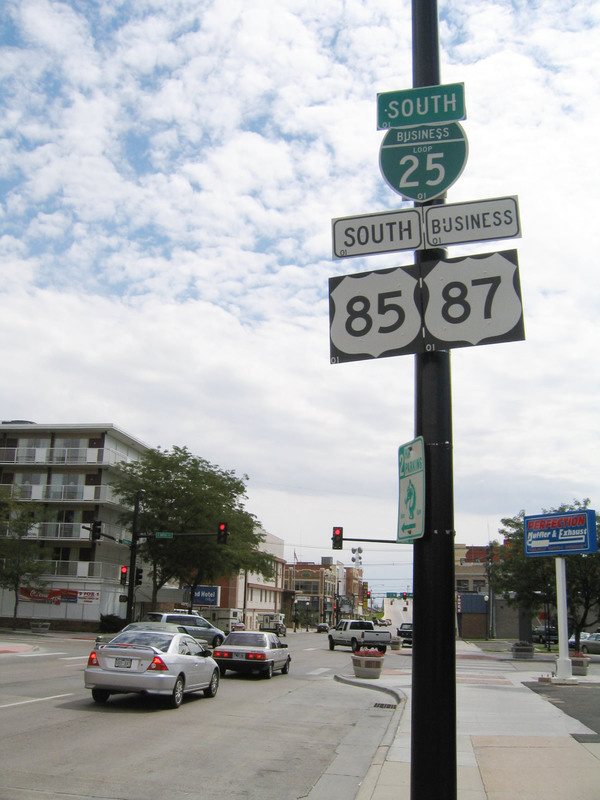 The next intersection on northbound Business Loop I-25, U.S. 85, and Business U.S. 87 is 18th Street. Photo taken 09/01/04. 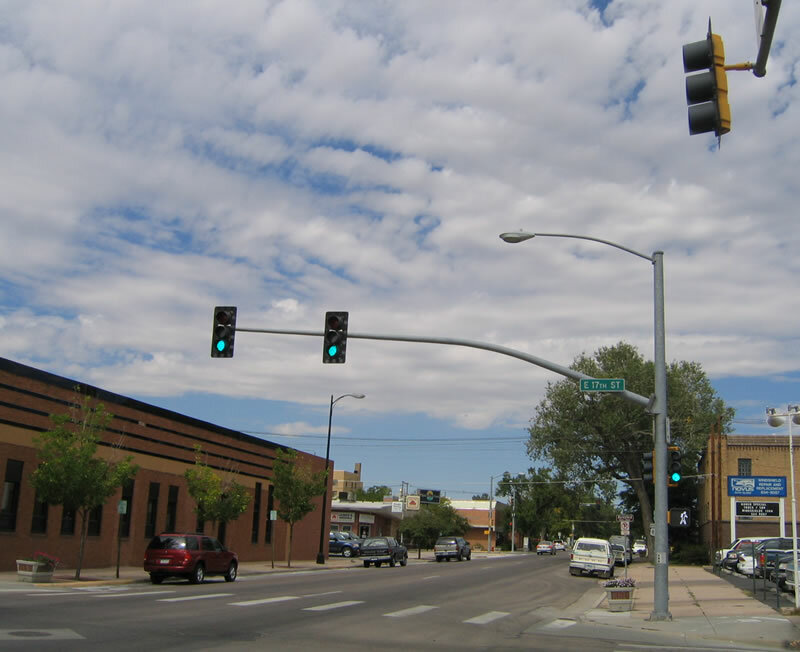 Following along Business Loop I-25, U.S. 85, and Business U.S. 87, we find the next traffic signal is for 19th Street. Photo taken 09/01/04. 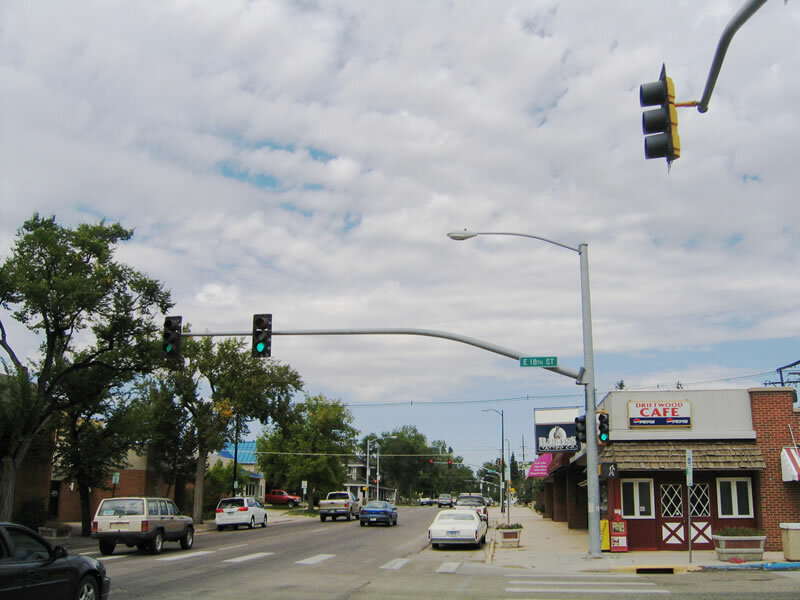 Another business loop shield assembly is posted after 19th Street, but it is now signed as "To Interstate 25." Photo taken 09/01/04. 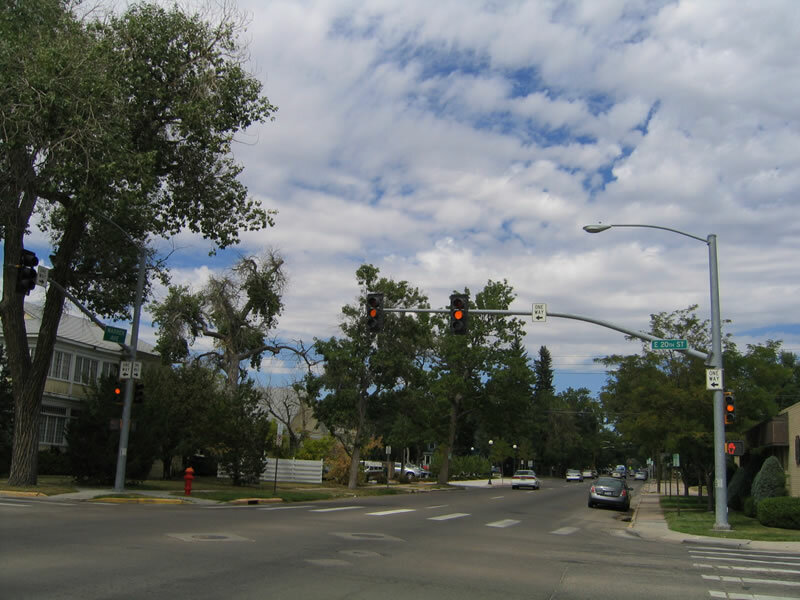 Unlike most street grid systems in Wyoming cities, Cheyenne is nearly unique with its extensive one-way street system, especially near downtown. Here, northbound Warren Avenue reaches 20th Street. Photo taken 09/01/04. At 24th Street, Warren Avenue reaches the state museum, which includes a small park bounded by Warren Avenue, 24th Street, and Central Avenue. Photo taken 09/01/04. 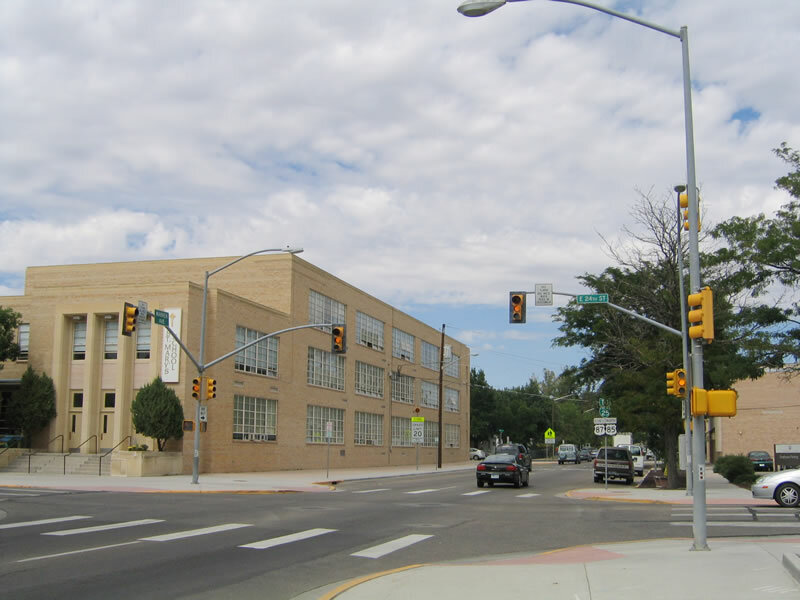 Northbound Business Loop I-25, U.S. 85, and Business U.S. 87/Warren Avenue meet the 24th Street traffic signal; St. Mary's School is located on the northwest corner. Photos taken 09/01/04. This shield assembly is located immediately after the 24th Street intersection. A green business loop shield is placed here, with a TO banner, which is incorrect since we are looking at the business route. 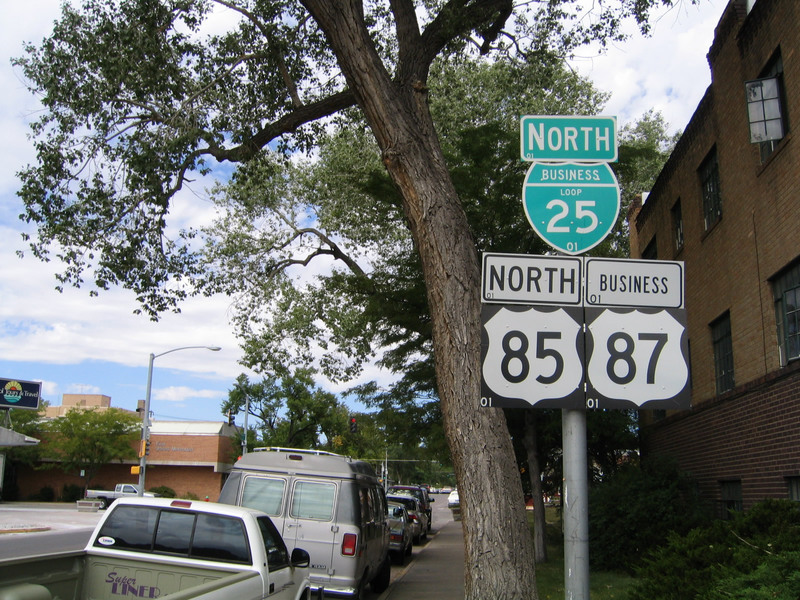 It is possible that the business loop shield was incorrectly placed and it should have said To Interstate 25 ... or the TO banner should be replaced with "North." Photo taken 09/01/04. 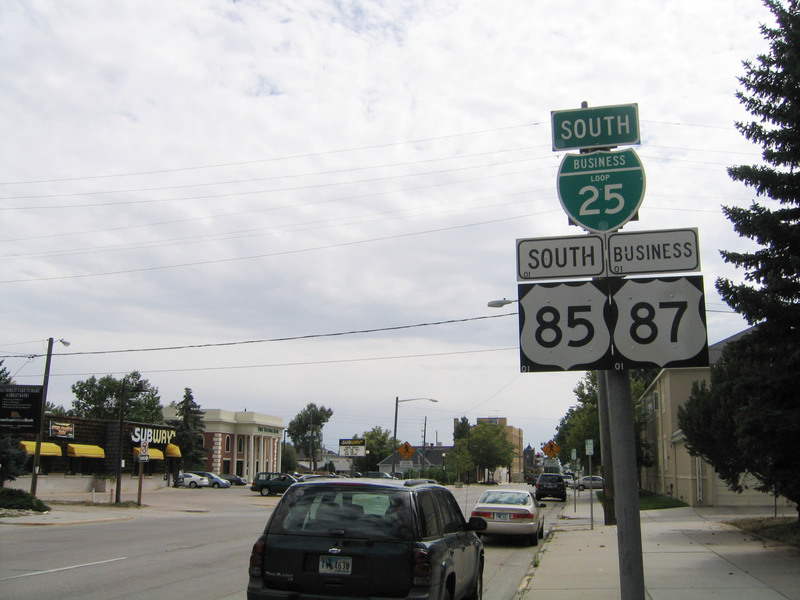 We begin the southbound journey near the state capitol along southbound Central Avenue, which carries Business Loop I-25, U.S. 85, and Business U.S. 87 south toward downtown Cheyenne. Photo taken 09/01/04. 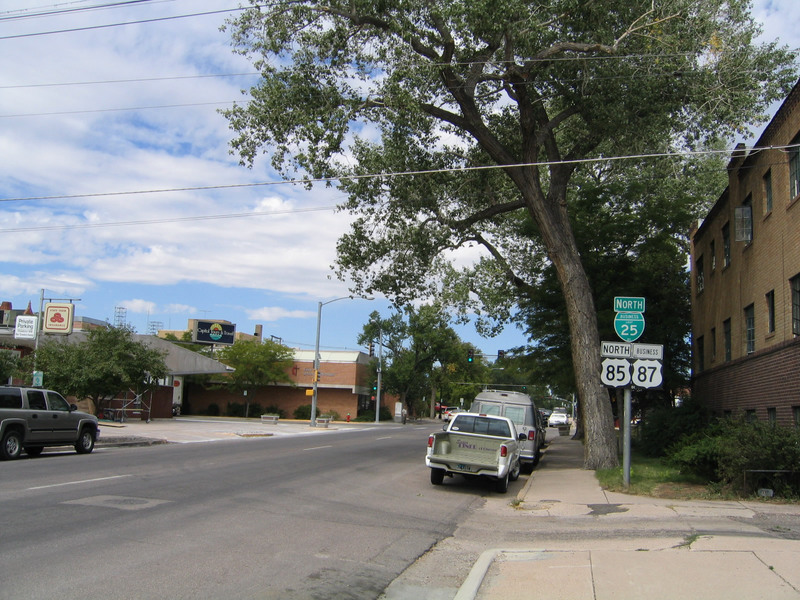 Here, southbound Business Loop I-25, U.S. 85, and Business U.S. 87 reaches 19th Street. Photo taken 09/01/04. 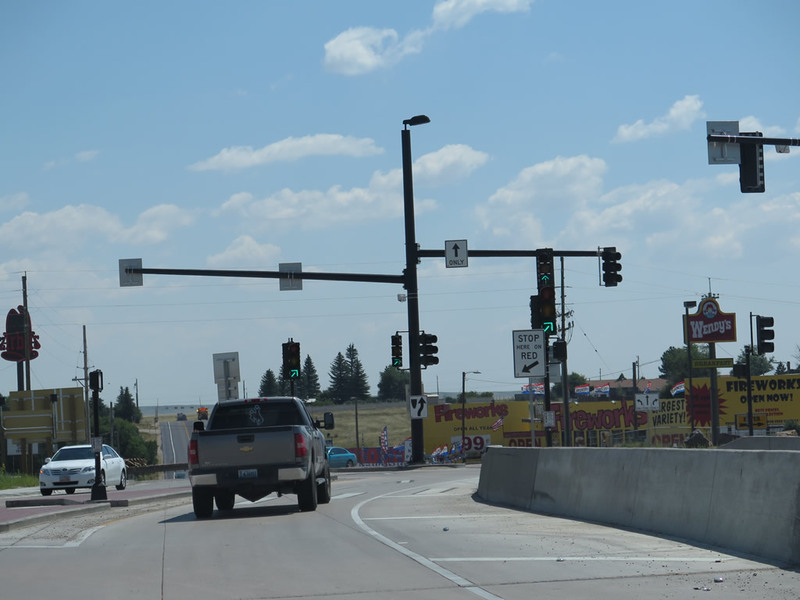 A reassurance shield assembly is posted for Business Loop I-25, U.S. 85, and Business U.S. 87 after the 19th Street intersection. Photo taken 09/01/04. 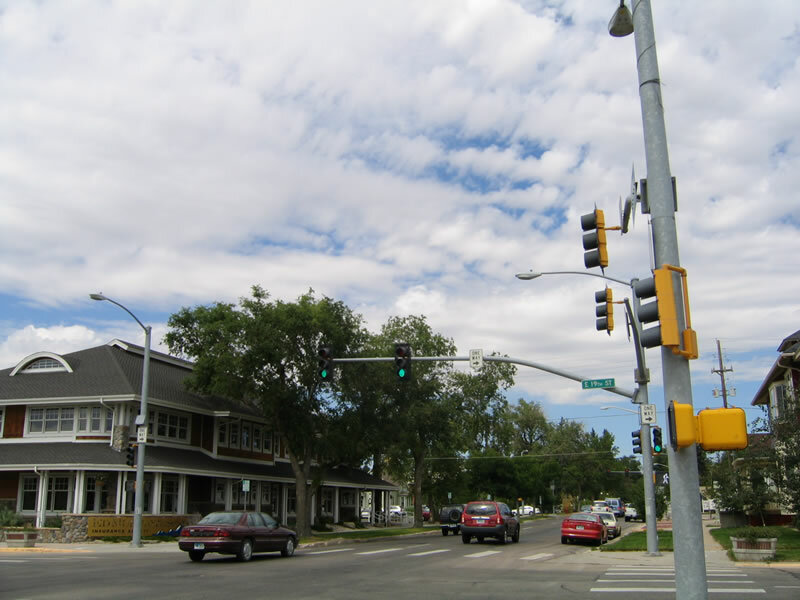 An unusual street lighting system is in placed on the traffic signal system on southbound Central Avenue at 18th Street. Photo taken 09/01/04. 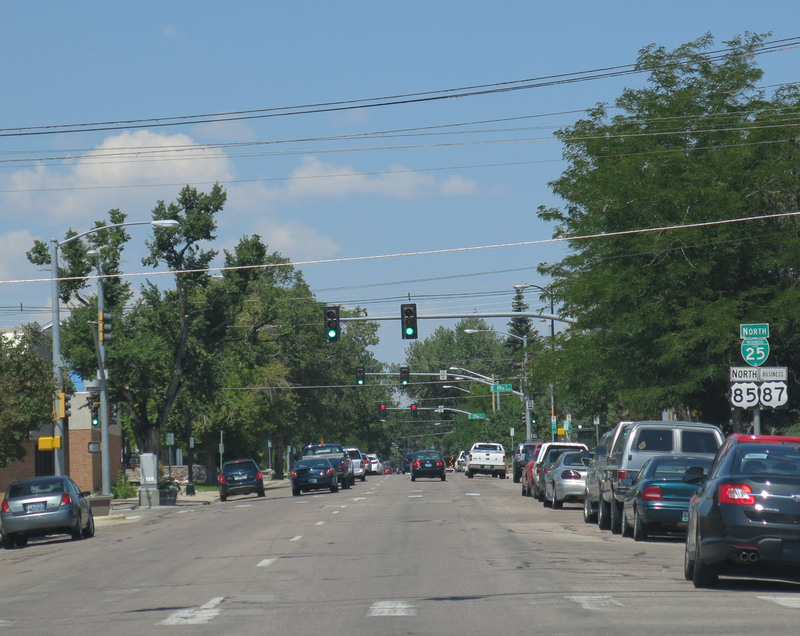 Now at 17th Street, southbound Central Avenue enters downtown Cheyenne. Photo taken 09/01/04. 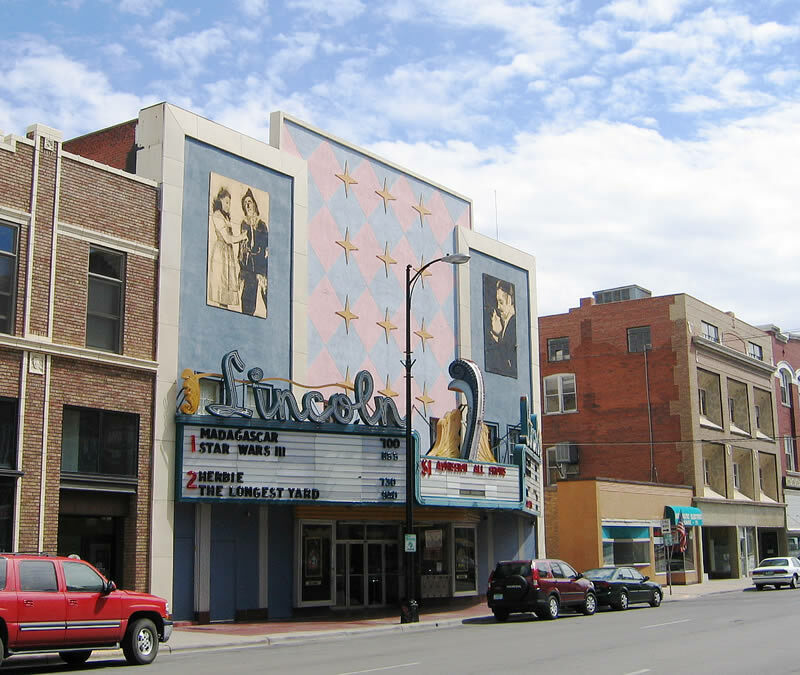 The Lincoln Theater is located on the east side of Central Avenue just prior to Lincolnway/16th Street, before the beginning of Interstate 180 and the twin Union Pacific Railroad viaducts. Photo taken 09/01/04. 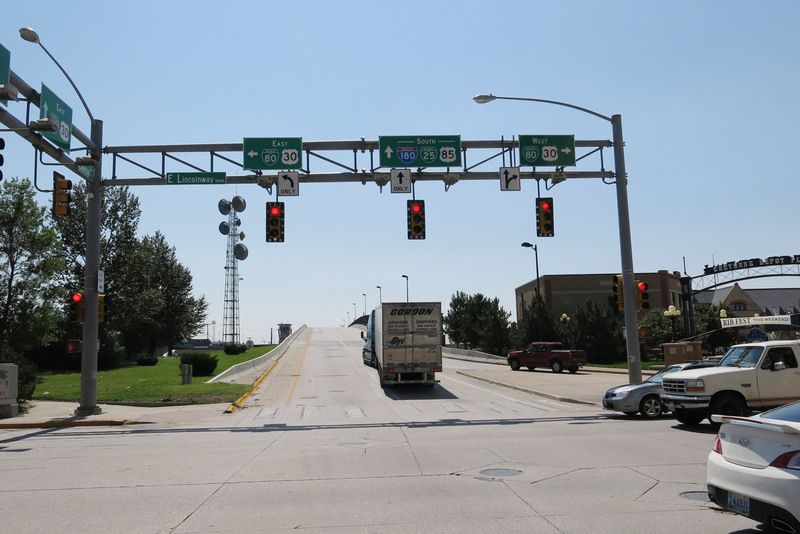 Southbound Business Loop I-25, U.S. 85, and Business U.S. 87 follow Central Avenue to Lincolnway (Junction Business Loop I-80, U.S. 30). This is the first Interstate 180 shield along southbound Central Avenue. The highway prepares to cross the railroad viaduct. Photos taken 08/15/13 and 09/07/05. 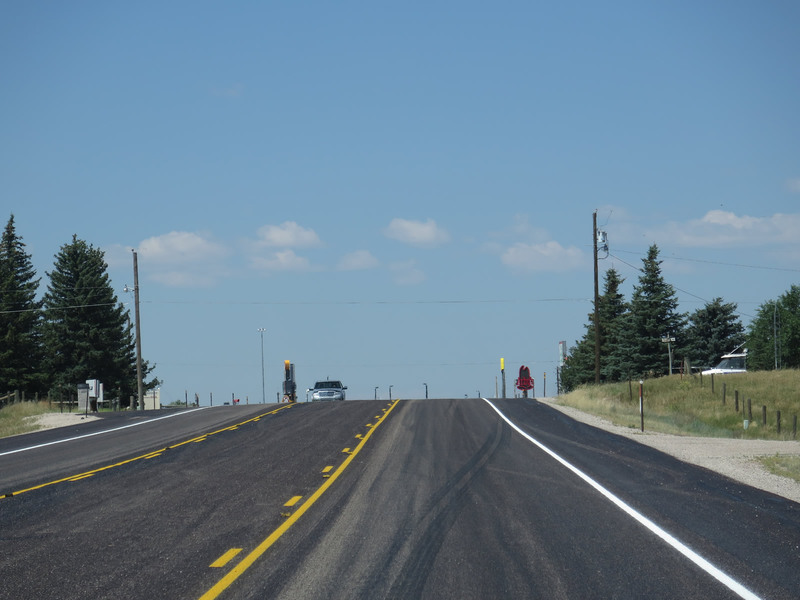 See the Interstate 180 page for photos and commentary of this section of Business Loop I-25. 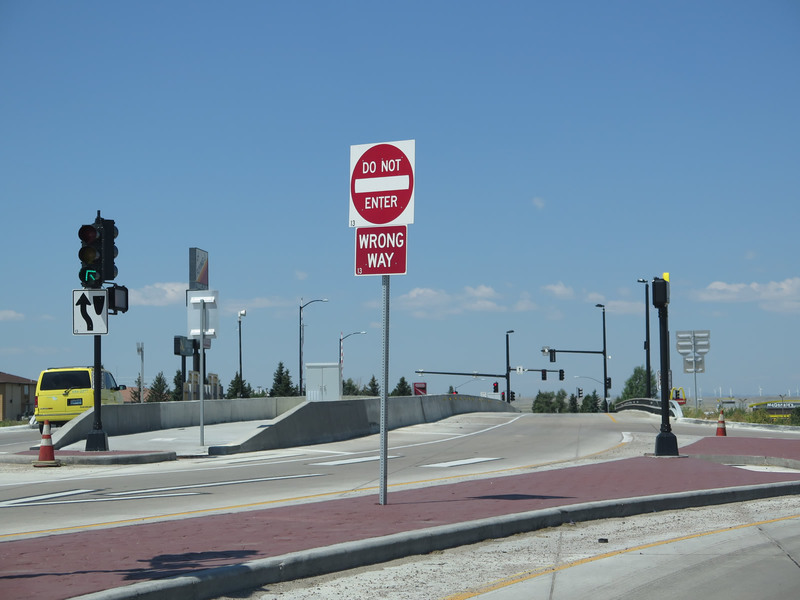 See the U.S. 85 page for photos and commentary of this section of Business Loop I-25. 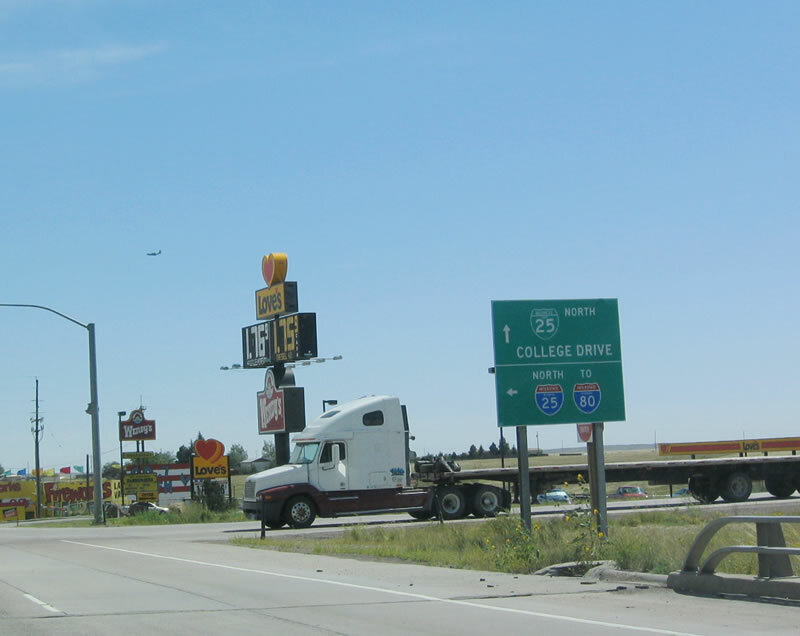 After the intersection with U.S. 85/Greeley Highway, southbound Business Loop I-25, Business U.S. 87, and Wyoming 212 follow College Drive west toward Interstate 25 Exit 7. 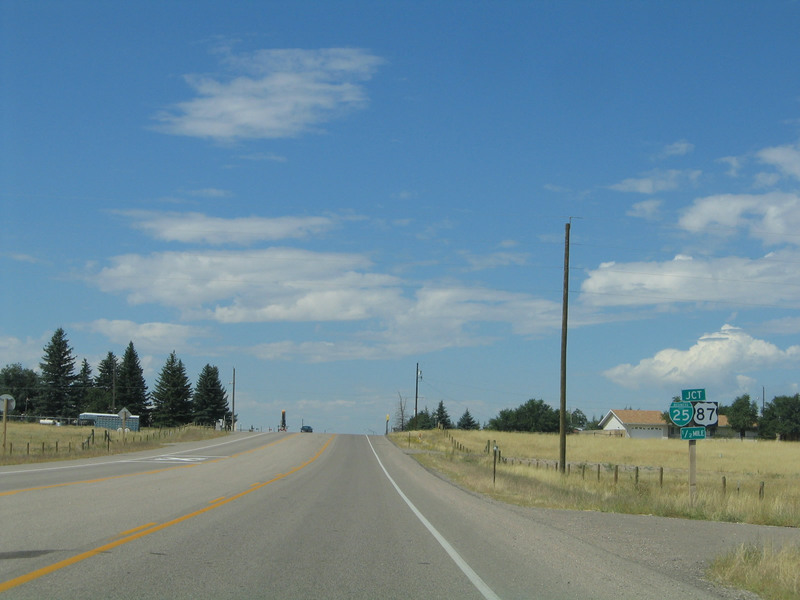 Note the use of a trailblazer for Interstate 25 followed by a Wyoming 212 reassurance shield. Photo taken 09/06/05. Continuing west along College Drive, this traffic signal connects College Drive and Walterscheid Street. Photo taken 09/06/05. 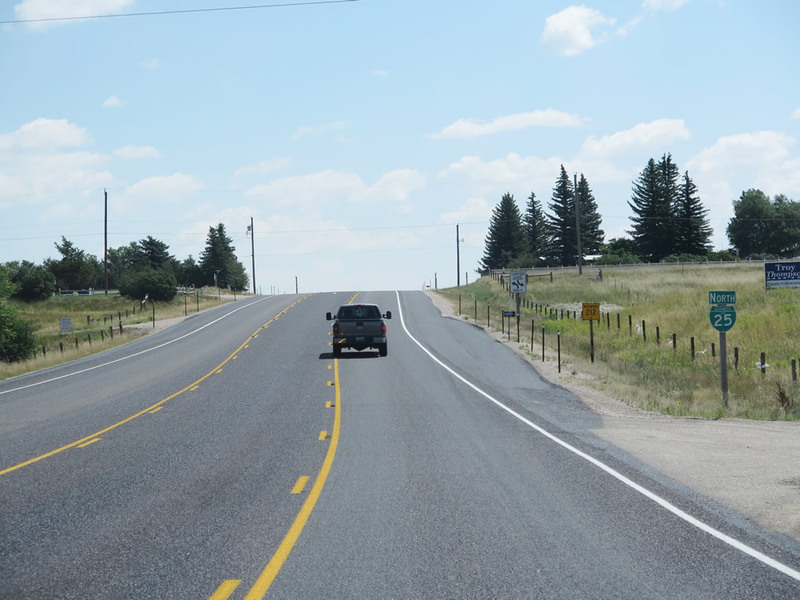 Some of these rural areas along Wyoming 212 are slated for future development as part of the anticipated development of the Cheyenne metropolitan area. Photo taken 09/06/05. Westbound Wyoming 212 and southbound Business Loop I-25 and Business U.S. 87 travel toward Interstate 25. Photo taken 09/06/05. 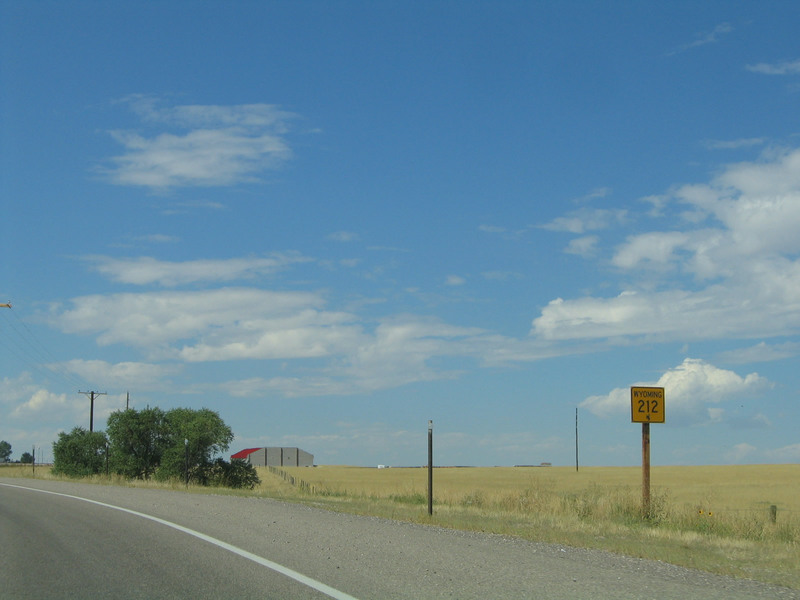 A Wyoming 212 reassurance shield appears after the To Interstate 25 trailblazer. Photo taken 09/06/05. 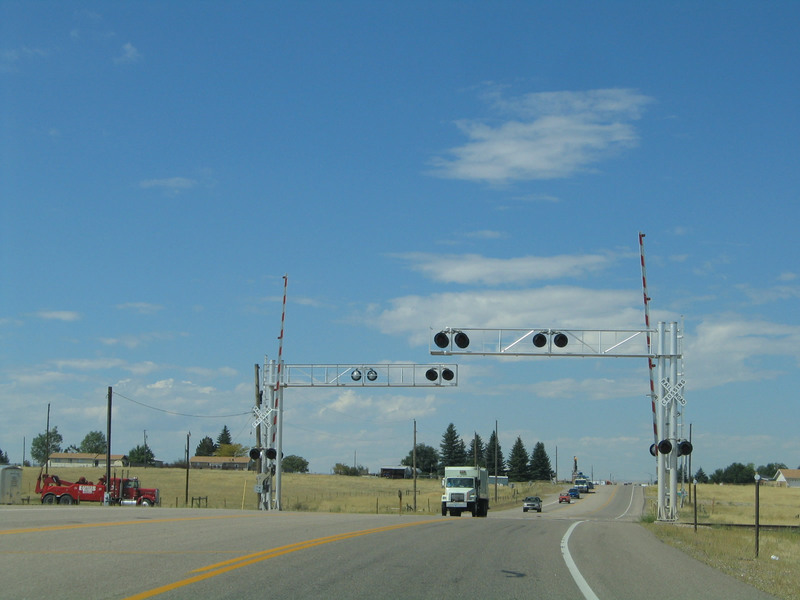 College Drive crosses the Burlington Northern Santa Fe railroad tracks here. Photo taken 09/06/05. Westbound Wyoming 212 and southbound Business Loop I-25 and Business U.S. 87 approaches Interstate 25/U.S. 87, one-half mile. 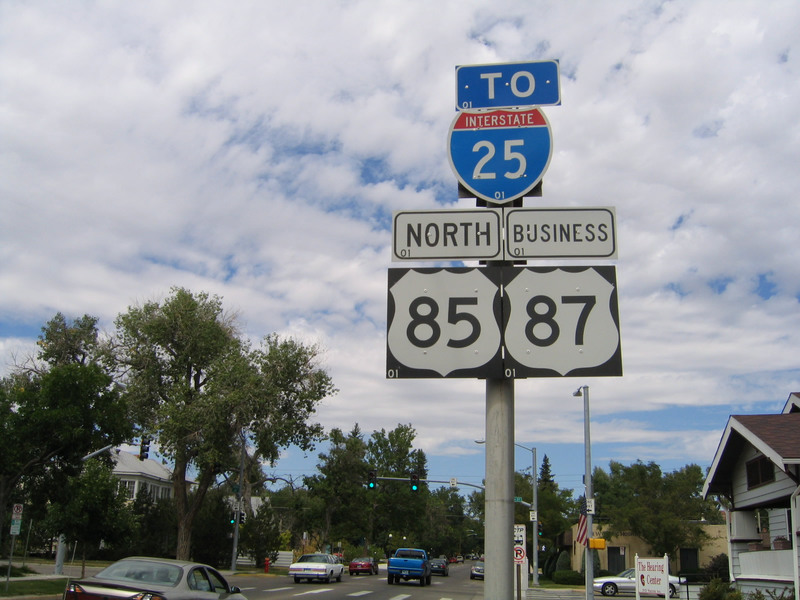 Note the use of an error Business Loop I-25 shield; it should be an Interstate 25 shield. This was fixed by 2010. Photos taken 08/11/14 and 09/06/05. Gas and food (and fireworks!) are available at the Interstate 25 interchange with College Drive. Photos taken 08/11/14. College Drive widens as we approach the Interstate 25 interchange. 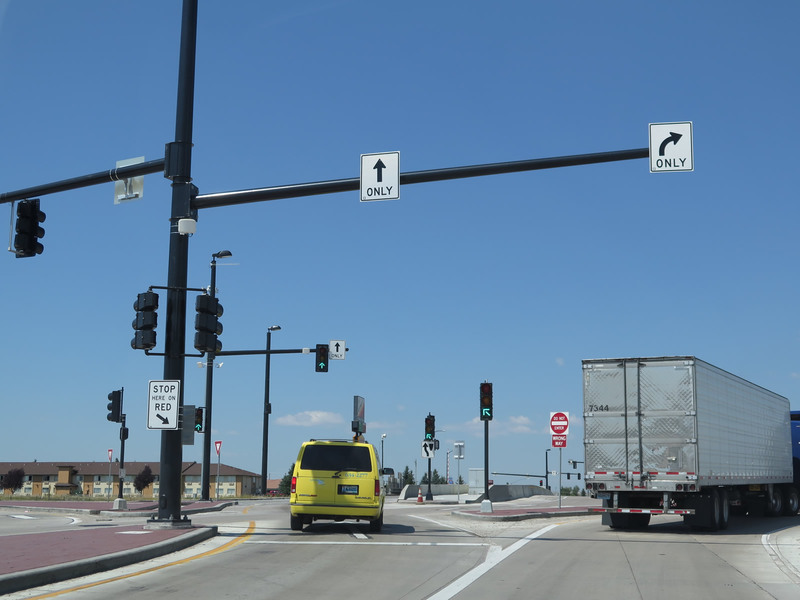 The final intersection before Interstate 25 is with Southwest Drive. Photos taken 08/11/14. 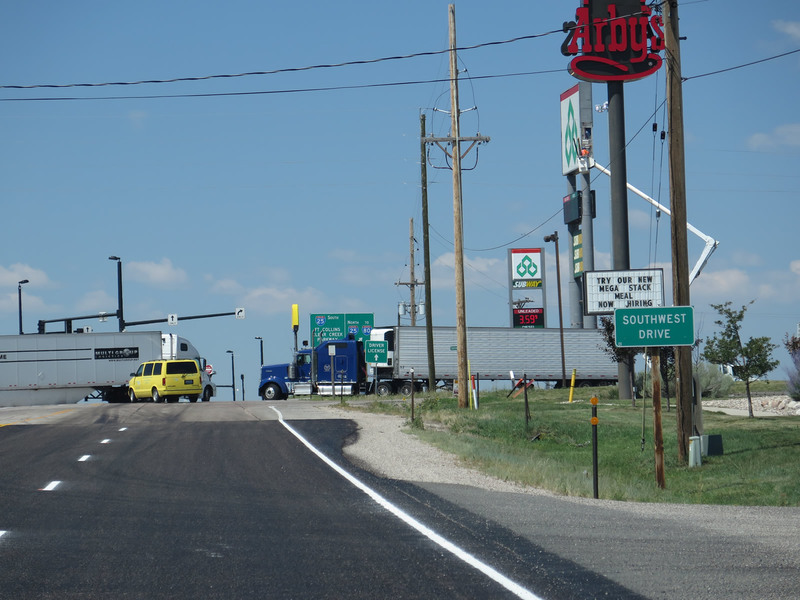 Business Loop I-25, Business U.S. 87, and Wyoming 212 meet Interstate 25 and U.S. 87 at Exit 7. 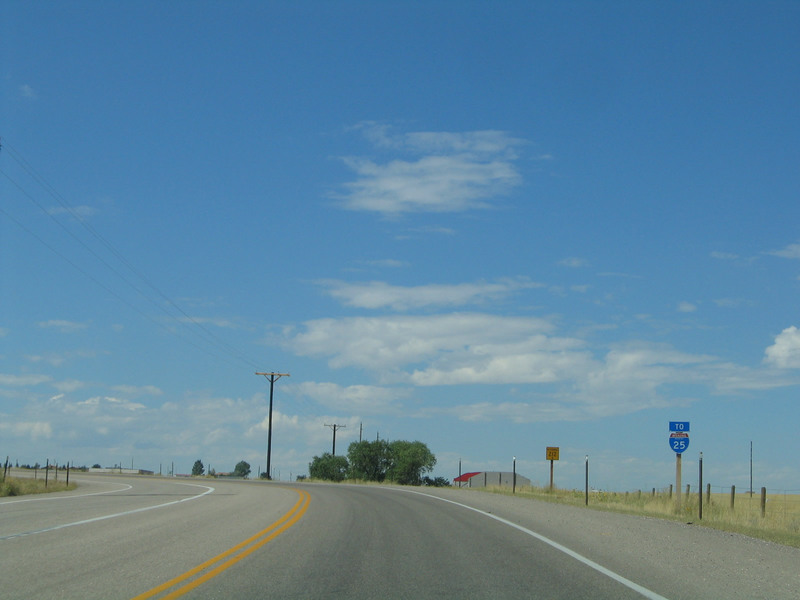 Turn right for Interstate 25 and U.S. 87 north to Cheyenne, Wheatland, Douglas, Casper, and Buffalo. 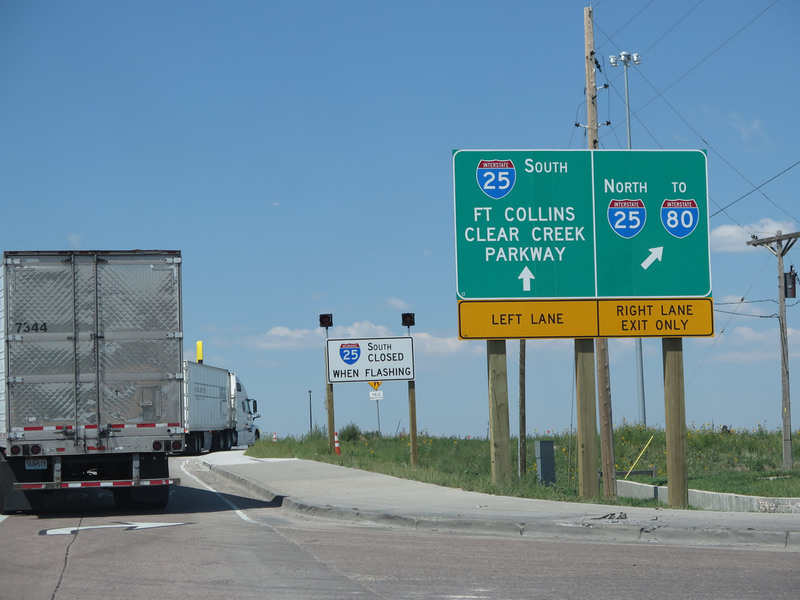 Turn left after crossing the bridge for Interstate 25 and U.S. 87 south to Fort Collins and Denver. 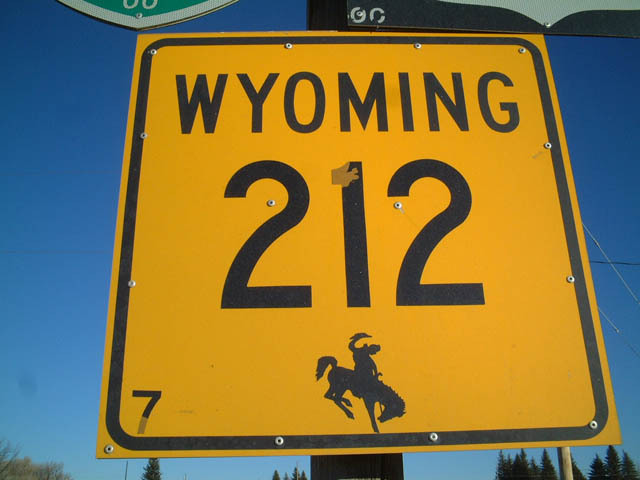 This marks the southern terminus of the two business routes and Wyoming 212. Photos taken 08/11/14 and 09/06/05. 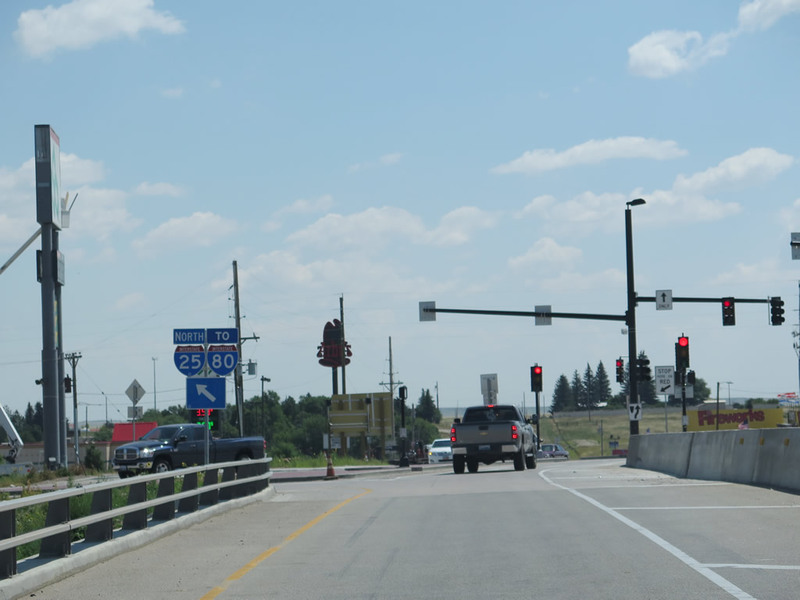 In 2013, the interchange between College Drive and Interstate 25 and U.S. 87 was modified from a standard diamond into a diverging diamond interchange. This change results in traffic merging onto the left side of the bridge after queueing up at the first traffic signal. Photos taken 08/11/14. Page Updated September 4, 2014.